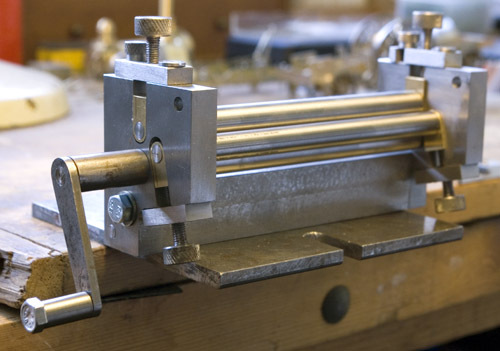 At twelve inches to the foot scale, boiler plates were bent in a machine variously described as a rolling mill or bending rolls, and this is a small scale version of that. 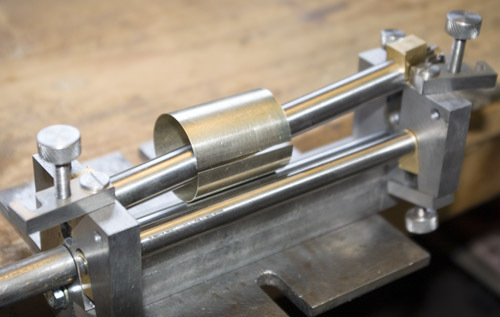 The photos show that it consists of two pinch rollers and a bending roller. The plate to be bent is trapped between the two pinch rollers. The lower one is turned by the handle and the upper one is forced against the plate using the screws on each side. It is not essential, but it helps to have the two rollers geared together so that the top one cannot slip. If it is not geared, it has to be pinched harder to ensure that it rotates. So by turning the handle, the plate is moved through the rollers. The bending roller is set high enough in relation to the other two to cause the plate to bend, and the higher it is set, the sharper the bend. The height of this roller therefore needs to be adjustable, and that is the function of the two lower screws. 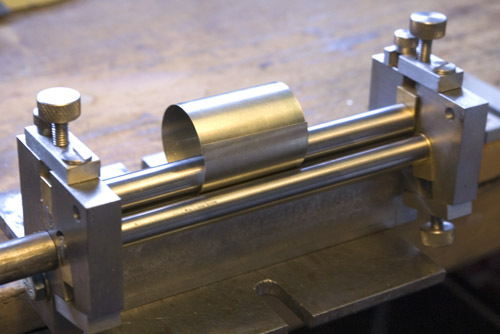 There is some trial-and-error involved in getting the right bend radius, and in general, it is good practice to start off with the bending roller set fairly low and roll a gentle radius, then gradually increase the height of the bending roller, moving the plate backwards and forwards by turning the pinch rollers, until the radius is tight enough. Mine is based on a design by G. H. Thomas that appeared in Model Engineer back in the 1970s and republished in The Model Engineer's Workshop Manual (TEE Publishing). It can also be downloaded as a PDF. Thomas's design was too big for my needs, so I scaled it down to about 50% size, without being slavish about the non-critical dimensions, and working with stock size materials. I never anneal the material for bending or any other purpose. For most work I use nickel silver that is described as “half hard”, and with the bending rolls I have no trouble getting it into shape. Curved shapes are always more difficult to get right than flat ones, and wherever possible I make parts slightly oversize and trim them back after fitting. A little bit of forethought often makes this possible. Surprising as it may sound, I found that it is possible to roll plates that have had rivets impressed. I put it down to two things. The act of pressing the rivet probably work hardens the material locally so that they do not get crushed by the pinch rollers. And the rivets make the plate less likely to slip in the rollers, so that less pinching force is required anyway. That said, if using other materials, and particularly soft ones, I would try it out on a test piece first. If necessary, the rivetted side of the work piece can be protected with a sheet of cardboard while rolling. For a boiler, or any other cylindrical part, you end up with the plate wrapped around the top roller. It can often be sprung off, but if not, the top roller can be removed in order to release it. You can roll conical as well as circular boilers by setting one end of the bending roller higher than the other. Again, some trial-and-error is required to get the correct bend radius at both ends of the boiler.